This is a very simple recipe for a chocolate cake that I wanted to try recently. I was surprised how well it turned out and it just goes to show that the simple things in life are often the best. It was really most, soft and wonderfully delicious. This homemade chocolate cake was so easy to prepare it is become my new favorite go to chocolate cake recipe. Stir in the boiling water last. Batter will be thin. Pour evenly into the prepared pans. Even better if you use 1C of hot coffee instead of the water. If you click on the words “Show Recipe” just above the RED box (above), you can see the recipe. However, it’s just the cake, not the filling or icing. 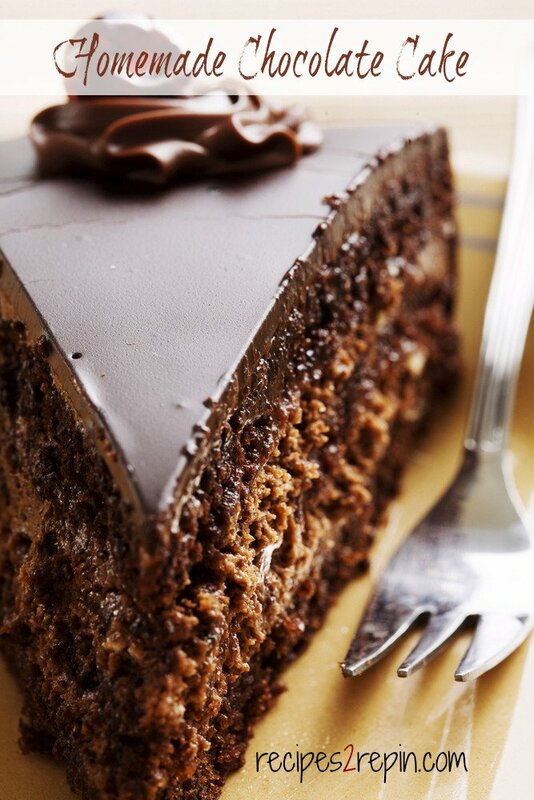 I have only made the cake without the icing….it is the moistest cake I have ever had. It is delicious. Hello, you can’t post a picture like that without telling us how to make the frosting and filling too!